What did you do in November? Well, I wrote a novel. Not to brag or anything, really, cause it’s quite terrible at the moment. I’m also not alone in writing an entire novel in thirty days. I had around 200,000 people from around the world joining me in the National Novel Writing Month, otherwise known as NaNoWriMo. 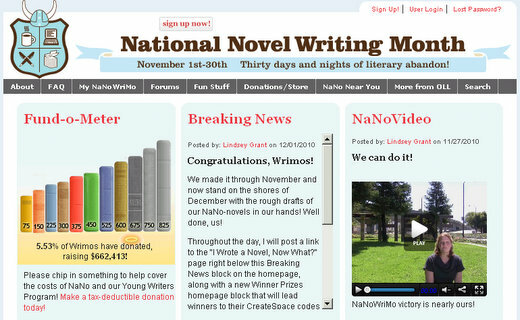 NaNoWriMo brings together professional writers, amateur writers, and wannabe writers for what the site deems “Thirty Days of Literary Abandon.” The contest dares you to write 50,000 words in the month of November. What’s the Prize? A certificate and a crappy novel. Why then is it so popular if you don’t win anything? The writing community and the camaraderie. The site has local chapters for most of the US and Europe. Libraries and bookstores have special spots and days for writers to congregate. You receive emails from famous writers like Neil Gaiman and Piers Anthony to spur you on towards your goal. They’ve got workshops, parties, balls, and funny videos. It’s the social network of fellow literary idiots that makes it worthwhile. The contest has grown from 21 participants in 1999 to 167,150 participants in 2009. So if you’ve ever wanted to write a novel – even if it is a terrible novel about Harry Potter teaming up with Jack Sparrow to hunt down Edward Cullen – sign up for next year. The site is www.nanowrimo.org if you want more information.